Well it is a good thing that I decided not to do a playoff prediction post on how the New York Ranger and New York Islander prospects and their teams were going to do as I would have been eating words after just the opening night. Two games and two huge upsets on the opening night of the playoffs tell me that this is going to be an interesting playoff season. First off Mackenzie Skapski (NYR 2013 6th) of the Kootenay Ice was entering the playoffs as cold as a goalie could get. 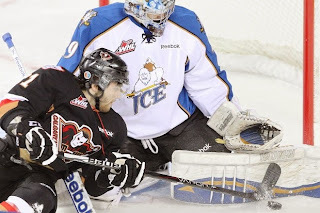 Just 5 days ago there was Skapski getting the yank for the 2nd straight night against these very same Calgary Hitmen. Skaspki gave up 7 goals on 28 shots while not making it past the 29 minute mark and now he was facing the team that had the 2nd best record in the WHL's Eastern Conference. Surprise final score from game 1 was Kootenay 5 Calgary 2 as Skapski stopped 27 out of 29 shots to help his Kootenay Ice steal away Game 1 and series home ice advantage from the Hitmen. The credit belongs to Kootenay coach (Former Hartford Wolfpack head man) Ryan McGill as he had his players ready to play strong team defense from the moment the Ice hit the ice. The Ice held the Hitmen to just 5 shots in the 1st period and to be honest it did not like Skapski had shaken his "blues" giving up a goal just 4:06 into the game to help Calgary to a 1-0 lead. That would be all that Skapski would allow until the last minute of the game when he would surrender a meaningless shorthanded goal but I give him a pass as he had been run a couple of minutes prior when the game disintegrated into a cheapshot festival. Skapski got the job done as he held Calgary to that 1 goal for most of the game but one also has to give Calgary some credit too as they played like crap after they got the 1-0 lead. Adam Tambellini (NYR 2013 3rd) earned a secondary assist on Calgary's 1st goal for his 1st ever WHL playoff point and he had 3 shots for the night. But Calgary did more of the damage to themselves giving Kootenay 7 power plays of which the Ice would cash in on 3 of them. Meanwhile Calgary would only have 1 power play of their own for the game as they gave Kootenay 2 lengthy 5-0-3s which hurt the Hitmen's chances. Kootenay takes game 1 and game 2 will be Saturday night in Calgary. The bigger upset took place in the first ever Big Ten Conference playoff game as Cristoval Nieves (NYR 2012 2nd) and his 12th ranked Michigan Wolverines were shocked in double overtime 2-1 by Penn State. This loss just about seals Michigan's elimination from NCAA Tournament consideration. Penn State was playing like the true underdog behind a hot goalie and played with no pressure on them at all. After all Penn State entered this game 7-25-2 on the season and nobody was giving them any kind of chance against traditional hockey power Michigan. For Michigan it was Nieves who set up the tying goal in the 3rd period when he found Phil Di Giuseppe in front of the net for the score which tied the game at 1-1. It was Nieves 19th assist on the season but it wasn't enough as no way should Michigan have lost this game. Penn State is only in their 2nd year as a Division 1 program with their 7 wins but none were bigger than defeating Michigan and keeping them out of the NCAA Tournament for a 2nd straight year. Islander prospect goalie Eamon McAdam (2013 3rd) was the backup and did not see any action. Yes I am well aware that Michigan is still eligible for an "at-large" invite but go look at Pairwise and you see Michigan at 16th which is the tail end of the Tournament selection spots. Go play the "You play the committee" game and all it takes is just 1 upset for Michigan to be knocked out of the tournament. I say Michigan is done so Nieves will finish a disappointing 3-19-22 for his sophomore season. Nieves as a prospect in my eyes went backwards and needs a major bounce back season as a junior to be seen as a legit NHL prospect. Nieves has all the "right" tools like skating, speed, good ice vision, great hands and size but something didn't click this year and better click next year. Mackenzie Skapski (NYR 2013 6th) was named the winner of the "East Kootenay Community Credit Union Community Relations Award" by the Kootenay Ice.